The Blue Ridge Parkway was an incredible ride. The Parkway runs for over 460 miles and, like the Natchez Trace, is a national park for its entire length. Both of these narrow, ribbon-like parks are beautifully managed by the National Park Service. The Blue Ridge Parkway begins at the Cherokee Indian Reservation on the eastern edge of the Great Smoky Mountains National Park and runs north and east to Roanoke. Begun in 1935 under FDR, the parkway was originally called the Appalachian Scenic Highway. Construction was begun with private contractors but in 1936 Congress declared the highway part of the National Park Service. Construction was then undertaken by various New Deal agencies including the WPA and the CCC. Construction of the entire parkway took over 50 years to complete. It is one of the most visited destinations managed by the National Park Service. Having so enjoyed the Natchez Trace, we were excited to sample this other famous drive. Our ride began just east of Asheville and we enjoyed 91 miles of amazing scenery before we had to continue in a different direction. The first half of our ride was easily the most dramatic. We started at mile marker 382.6. The two lane highway wound around, up and over hills. We passed the spot where we had parked to hike the Craven Gap Trail. We continually gained altitude and the views just became more and more breathtaking. The speed limit on the parkway is 45 mph. While I am sure sports cars and motorcyclists find that speed unnecessarily turtle-like and conservative, it was hard to travel that fast with trailer in tow. Curves could be tight and with only horizon beyond them, it seemed prudent to take our time and relish the experience. Also breathtaking was the guard rail situation. Sometimes there were guard rails along the roadside before a sharp drop off. These were often rustic wooden affairs. 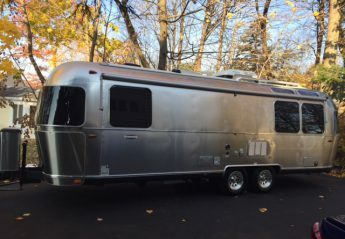 It was hard not to wonder if they could possibly stop the forces of gravity and trajectory involved with a 28’ Airstream and Ram 2500 Laramie with Cummins diesel engine. More often there was simply no guardrail at all. The edge of the road gave way to an amazing vista and clean mountain air. The highest point for us on our drive was Craggy Gardens at mile marker 364. As we approached the visitor center and parking lot, we were enveloped by clouds. We had gained over 3500 feet in elevation since joining the trail. When shopping for our hike the day before, I had toyed with hiking the Craggy Pinnacle Trail, but discarded the idea due to the trail’s short length. Now I was kind of glad. One of the things which often gets hikers in trouble is failing to take into account the impact of elevation changes. The temperature must have dropped by 20 degrees. We would have frozen up here on the trail. The parkway is dotted with scenic overlooks and pull-offs. It was difficult to pass any of them without stopping. Each vista was breathtaking and not-to-be-missed. It was as if the planners couldn’t help themselves and needed to provide a stop for each successive vista. We stopped at many of them. Tunnels are also frequent along the parkway and added yet another element of excitement! The second half of our Blue Ridge Parkway drive took us to lower elevations. The scenery was still glorious, but less terrifying. The mountains gave way to hills and finally to fields and signs of civilization. Local roads intersected the parkway and houses could be glimpsed through the trees. Lunch was quite a visual affair. We stopped at yet another amazing pull off just below Grandfather Mountain. I made sandwiches and we sat munching away as we stared up at the impressive mountain. This was close to the end of our time on the Parkway. We exited at Blowing Rock at mile marker 291.9. Highway 321 took us in to the town of Boone and onward through more lovely rolling hills and small towns. It was almost disorienting to be back in civilization after such an engrossing and eventful drive through breathtaking scenery. It was as if we had woken from a strange and beautiful dream. The countryside we drove through as we headed to the Rock Island State Park was gorgeously green with rolling hills, grassy pastures and deciduous forests. Once off the interstate, our trip wound through the countryside and through small towns. We passed through Lynchburg and noted the scrum around the Jack Daniels distillery. There had been signs advertising it for miles and miles, since back at the Interstate. Free tastes to drivers? Is that such a great idea? Turning off the highway at last, a narrow road led us past the small settlement of Rock Island and on to the park. Rock Island was a sweet looking village. It had a couple of small antiques shops, a local market and two churches. One of the antiques stores also sold cord wood. We would be stopping there later. The road was narrow and twisted constantly. It was heart-in-your-mouth exciting especially when hauling a 28 foot trailer. A river ran next to the road. This was the Caney Fork River and Gorge. We crossed a small bridge over a stream and passed an abandoned brick mill building nestled between the river’s shore and the narrow road. It felt like we cleared the corner of the building with barely an inch to spare. The river was now roiling and wild. It raged and fell cascading down the Great Falls Dam. The TVA had a power station here and it felt familiar to encounter this power force again. We made our obligatory stop at Ranger Headquarters. The amiable woman on duty gave us an assigned site right next to the Camp Host. When I asked if there were other sites open, she agreeably took a highlighter and marked almost every other site in the park. We had our choice among many. We chose a site at the back of the park. There was a tag on the site marker saying someone was supposed to be in that site. We were momentarily confused and I called the ranger with a miraculous bit of cell signal. She assured me the site was available. It was only afterwards we realized the tags were from the previous May. Very odd. Those tags stayed in place for a whole year and this was the week which duplicated them? Why did they stop putting out reservation tags? What did that mean for park maintenance? It remains a puzzle. We backed the trailer onto the pad. The picnic table and grill were nestled behind the site pad and that made it feel even more private. There was a nice even gravel pad and the picnic table was on a sort of gravel platform. The fire pit was well placed and called to us. A man came by with his truck. He dropped off some wood. He was heading home to Michigan and gifted us the logs. They were enormous chunks of wood and would make for a very big and long-lived fire. But not tonight, we were tired and ready to have dinner and turn in. It was 4:15 a.m. and I was lying awake in bed when suddenly light suffused the Airstream bedroom. I looked out our open front bedroom window to see the back up lights to a car. It backed itself into the camp site next to ours and turned off the engine. This was very odd and unsettling. What was this white SUV doing parking in the site next to ours in the wee hours of the night? There was no one anywhere near us and we felt suddenly alone and very vulnerable. I woke Jim and we considered what to do. We could see the driver in the reflected light as he checked his cell phone. Why was he here? Was he drunk? Did he have some nefarious intent? Had he had a fight with his wife and drove off angry? What was he doing in the middle of a campground in the middle of nowhere in the middle of the night? I went to get my phone and the campground info to see if there was a number to call for security. There was no cell signal. Jim turned the outside trailer light on to signal that we were aware of the interloper. Next he hit the unlock button on the truck so it beeped and flashed light. Shortly thereafter our sometime neighbor fired his ignition and drove off. We sighed with relief and went back to bed. It was the first time we had felt the slightest concern for our safety at the hand of another after so many weeks on the road. The next morning we were determined to get out and hike. We could not live in fear of ticks forever. There were numerous trails available in the park. First we poked around some of the park roads and visited what in warmer weather was the beach area. Then we drove out of the park past the Great Falls Dam to hike the Collins River Nature Trail. This trail was a three-mile loop through the woods. It followed the bank of the Collins River which was just visible through the trees and then looped around back to its beginning. It felt really good to be hiking in the woods. It was hot and sunny already, but the trees kept us shaded and cool. When we got back to the truck, we stood broiling in the sun while I did a tick check. Most happily there were no ticks. Hooray for us! We had managed to enjoy a hike with no negative after effects. After our hike, we visited the Caney Fork Gorge and the Great Falls Dam. The mill building which had so frightened us when we were first driving in to the park turned out to have been the only mill in Franklin County. It operated for ten years before a flood wiped it out in 1902. The waters washed the giant turbine away and it was too expensive to replace it so the mill simply closed down. Across the street there was an odd castle-like structure. This was a spring which had supplied drinking water to the mill. It was mossy and eerie and I am not at all sure I would want to drink this water. After dinner we made a lovely fire and sat out in the cool night air, warm from the fire. I had made a pot of beans and we ate those by the fire. The stars were bright overhead and we sipped wine and enjoyed the evening until late. Thanks in part to the wood from our Michigander friend, our campfire was still burning the next morning when we got up. We knew there would be rain on our second full day at the park. All day and that night it rained and rained. We spent the morning cleaning and doing our laundry. Later we drove into nearby Sparta to look around. With no cell or wi-fi at the campground, we sat in a bank parking lot for an hour catching up on email. Back in camp that afternoon, we took advantage of breaks in the downpour to get hitched and ready to go the next day. It was a quiet and early evening with reading and a little music. The next morning we woke to a grey and wet world. We pulled out and headed east. We were very excited to be visiting our next stop, the Great Smoky Mountains National Park. The drive from Pedernales Falls to our next stop at Mission Tejas State Park was tougher than we expected. The mileage wasn’t that far outside our normal range, but the drive seemed to take forever. We stopped for diesel once and then again for lunch. We were hungry and I had just remarked that the Texas highway department would do us all a favor if they put more rest stops along the highway when a blue rest stop sign appeared. I guess they heard me. It was a little late for lunch, but the rest stop looked green and serene. We pulled into a nice long spot by a picnic table and opened up the trailer. I was in the midst of making sandwiches when another Airstream pulled in to the rest stop! It was very exciting and seconds later our new neighbors were knocking at the door. Susan and Bob live in east Texas and had bought their Airstream in 2008. They actually bought their Airstream at Colonial from Patrick! (Patrick Botticelli is a legend in Airstream circles for his videos available on YouTube). That makes us sort of related. Cousins in Airstream ownership. We had two good chats. They were very friendly and enthusiastic. That is how Airstreamers tend to be especially with each other. It is a special society. It was after 5 when we reached our destination. Mission Tejas State Park is an old CCC camp and was founded and built in 1934. Not a big park, it has only 14 camp sites about half of which are for tent camping. It looked like they were in the midst of building a new park entrance when we were there. We never really did ask about that. The site the ranger assigned to us was one of the worst we have ever had. It was narrow. It spanned a rise with trees on the street side and behind. The pavement was laughably uneven. It was supposed to be a full hookup, but we could see no evidence of a sewer connection. In a comedy of errors we hadn’t dumped because we thought we would have a full hookup. When we saw no evidence of a sewer connection, we pulled off the site to head back to the dump station. We were so tired we were almost staggering as we returned to the site and worked with the Andersons to level the side to side of the trailer. We finally got it level. As we finished connecting shore power and water, we found the tiny little opening which was the sewer connection. We never did bother hooking up the sewer, we had already dumped. The site was so uneven we decided not to un-hitch. We would just stay put in the park for two days. Despite these rather sad beginnings, we liked our site. The trees surrounded us. It was green and leafy. The first day there were few campers. On the second day several families arrived and the forest rang with the kids’ excited voices and happy laughter and the deeper voices of parents chatting and catching up. The park didn’t have a lot of trails, but there were enough. We hit them first thing the next morning. There was almost no cell signal at our site and we figured we would follow the trails and end up out at ranger headquarters where we could hopefully catch some signal. Heading out to hike the first thing we did was to walk up the hill behind our site to check out the bathhouse as well as the Commemorative Mission building next to it. The bathhouse looked perfectly fine. It was a study building and clean. It is always reassuring to know a hot shower is attainable. Next we headed to the Commemorative Mission. This was a replica mission building was erected by the CCC when they built the park. It was a beautifully crafted replica of an old log building. Mission Tejas got its name from the Spanish who tried valiantly to settle the area and convert the local Caddo tribes. Tejas means “friend.” The Caddos were farmers. Ultimately, the Spanish attempt to convert the Caddo and other local tribes was a failure. Disease decimated the local tribes who attributed their illness to baptism. The park is heavily forested with pine, oak and maple. We first walked a nature trail around a pond which let to yet another trail called the Cemetery Hill Trail. We took a brief detour onto the Lightning Trail. This trail zigzagged through the woods, hence its name, and met back up with the Cemetery Trail which led, as one might suppose, through the woods to a cemetery. This was the local cemetery and still very much in use. The oldest graves, dating back to the 1800’s, intermingled with the newer graves charting generations of local inhabitants. We spent some time assimilating a bit of family history based on the names and dates on graves. One of the highlight historical sights in this park are the CCC baths. The park literature and signage on the trails exhort the visitor to see the CCC baths. In my mind I was picturing some good-sized bubbling springs which one could paddle around in to get clean and cool. I idly imagines if it was warm enough I could give them a try. Nothing could be further from the truth. When we got to the springs, we saw three holes which punctuated the earth. They were glorified puddles. There were the initial spring, the soaping and cleaning hole and the rinse hole. Imagine scores of sweaty, dirty men bathing in succession in the tiny, mud-lined holes. The men on the CCC crews lived in primitive conditions and worked really hard. They earned $30 per month, $25 of which was sent home to their families. Most of the men came from poor homes and in the depths of the Depression, these jobs saved their families from starvation and gave them skills and a sense of purpose. They built roads, bridges, parks like this, strung telephone and electrical wire and planted quite literally a billion trees. These CCC camps were stationed all over the country and did so much to build the park system which Jim and I have been so thoroughly enjoying. I give FDR full props for this. The CCC saved lives and constructively employed what would otherwise be lost resources. After viewing the CCC baths, we headed along the Big Pine Trail to ranger headquarters. We sat on the old buggy seat on the front porch and Jim downloaded the paper (sadly only part of it came through) and I tried to send a couple emails with little luck. Oh well, the hiking was good enough even without a digital payoff. Another major sight at the park is the Joseph Rice Log Home. This cabin was originally erected in another location along El Camino Real (the King’s Highway). Joseph Rice and his wife added to the cabin as they added to their family. It became a stopping off point for travelers. Eventually the cabin was no longer inhabited and was used for storage until it was donated to the park by the family. Most fascinating in looking at the cabin was the interpretive information about building techniques. Squaring off the logs, smoothing them and then maneuvering them into place was a substantial undertaking. It is hard to conceive of the painstaking labor involved and the craftsmanship required to get a roof over one’s head. It is possible to see the marks from the shaping tools on the logs. It is all beautifully preserved. Our return hike to our site followed the Karl Lovett Trail through a pine woods. The ground was thickly carpeted with pine needles and the red earth shone through in spots. The woods we had been in before were dense and green, this section of the park was much more arid and piney. We paused to look at the signage for the old fire towers. Jim always loves a good fire tower. He climbed one once in northern Michigan and it takes little prompting to get him to reminisce about the experience. When we had spoken to the ranger at headquarters, she warned us the ticks were bad. When we got back to the trailer, I spread the blue quilted movers blanket we keep in the truck and began a tick check. Bingo. Dakota had a pretty good crop of ticks on him. Jim grabbed the tweezers and fire stick and we removed some ticks. This was an unpleasant reminder that we were no longer in the dry country. We would need to be careful moving forward. We spent the afternoon reading and knitting (I was knitting, not Jim). It was a delight to use the sturdy bathhouse with hot running water and not the CCC bathtubs. We enjoyed the quiet and relaxing afternoon. We had a cozy dinner. Since we had not unhitched the next day’s getaway would be swift. We would head to our last park in Texas. The eastward push was really underway. We’re On the Road Again, Willie! Despite my deep desire to get back to San Antonio, re-entry was a bit challenging. Simultaneous with the challenges in getting a flight back, I suffered a technical challenge with my email support. Verizon was discontinuing email service and when I tried to move my account, it was frozen. Two lengthy calls with Verizon later, the upshot was I needed to change email addresses. This was a huge and unwelcome task. So I spent that first day back in San Antonio dealing with Delta in trying to get a refund for my ticket (down to a ninety minute wait) and changing email addresses. It was hot at Blazing Star and we did not want to be there. We were missing one of the parks we had most hoped to see: Pedernales Falls State Park. Finally, common sense rallied and the next morning I called the park to see if they could still accommodate us. We were assured we could salvage two days of the four we had planned to spend there. We immediately felt much better. We hitched up and were were back on the road in no time. The same ranger I had spoken to on the phone was on duty when we arrived. There had clearly been a major downpour at the park. When we arrived at our site, there was quite literally a river running through it. A stream ran though our site and the step into the trailer was under water. We were a little daunted, but the site was really pretty. We had our very own little meadow. There was lots of space around our site. We decided to stick it out. As we un-hitched, we could see the flow of water beginning to diminish. By the time we returned from a get-to-know-it perambulation around the campground, we were almost on dry ground. The two nights we were able to salvage at Pedernales (locals pronounce it Perdernales, per the park ranger this pronunciation dates back to LBJ, I don’t know about that, but everyone really does pronounce it with the “r”), gave us one day for hiking. Looking at the map, it was hard to choose where to hike. There were so many attractive options. We decided to hike Trammel’s Crossing and the 5.5 Mile Loop to which it led. When we got to the trailhead, all bets were off. We were just beginning to understand that Pedernales Falls was a flash flood zone. Due to yesterday’s very heavy downpour, the river was up and running hard. Trammel’s Crossing was under deep and fast running water. Reaching the 5.5 Mile Loop was impossible. A nearby camper directed us to the nearby Twins Falls Trail. We took that as a warm up hike and visited the little waterfall on the trail. After some debate between the Wolf Mountain Trail and the Pedernales Falls Trail System, we opted for the latter. It was a very fortunate decision. We would never have wanted to miss the falls for which the park was named. The Pedernales Falls Overlook was fairly crowded, but we headed up the trail and were soon totally alone in a very beautiful landscape. It was a beautiful landscape with a frisson of fear attached to it. We walked out onto the rocks. Signs warmed to watch the water even on a sunny day. If it turned muddy and brown, run for the hills. Literally. We ate our picnic lunch sitting on some rocks looking at the glorious view. We got a bit turned around with the trails and wandered onto the North Loop Equestrian Trail. It was hot and very sunny as we followed the wide track. There were enormous colonies of fire ants. We picked our way around them, but they made me wish we were on horseback. Eventually, we ended up back at the park road which wasn’t our goal. There was room for improvement in signage at this park. We realized if we headed back towards the parking lot, we could pick up the Hackenburg Loop Trail. We followed what we thought was the correct track and encountered a sign which said “river” with an arrow. This seemed a bit inscrutable, but beneath the wood cut letters was a small dymo-label “Hackenburg Loop.” Someone else recognized the signage shortfalls. This proved to be a lovely trail through meadows and along the river downstream from the falls. Spring was in full flower and we marveled at the bountiful wild flowers. It was thrilling to see a prickly pear cactus in bloom. We had admired so many on so many trails, we finally got to see one in bloom! The river was running hard and fast. No wonder our first choice trail was closed. This water was impassable and deadly. The force of the water was apparent along the banks. Trees hung onto their ground with tough, exposed root systems. Hold on guys, it is just a matter of time. The water will win. When we finally returned to the beach below the Pedernales Falls Overlook, we were footsore, but happy. It had been an especially rewarding hike. Back at our campsite, we visited the Camp Host and bought some fire wood and a fire starter. It was a complete delight to relax after dinner by the cozy fire and gaze at our private meadow as the darkness deepened. We were so fortunate to have made it to Pedernales Falls. We could stay a week at least, but tomorrow the camp would fill and we were expected elsewhere. Maybe its good to leave wanting more, we hope to be back one day. The force of the water laid leaves in a lovely pattern. We motored along Interstate 10 past the somewhat tawdry area of Lake Charles and crossed the border into Texas. At Beaumont we hung a right and headed up Route 92 to Lumberton. Up over some tracks and through a little subdivision and there was the Village Creek State Park. The campground at Village Creek was perched on a hillside with 25 sites marching down each side of the camp road. Oddly enough, this park was also quite empty. We were beginning to feel a little weird about all these empty parks—especially when we keep having trouble making reservations. What gives? The most interesting aspect to our site in this park is its shape. It is the equivalent of a railroad car style New York apartment. The picnic table and living area of the site was actually situated behind where our trailer was parked. Trees ringed our site and the whole effect was really pleasing. The best part about this park is the hiking trails. During our three days here, we had two great hikes. Our first hike was the Water Oak Trail. This trail led through several different kinds of landscape from sandy areas with cactus and yuccas to swampy bottomland. Past hurricane damage was apparent both from the damage to trees and the decimation of bridges across the swampiest parts. In places fallen trees had been pulled into service as ersatz bridges. We took turns carrying Dakota over those areas. At one point on the trail I looked down in my ever vigilant search for snakes and saw an unbroken string of yellow. Little bits of yellow petals were parading across the trail. It was a whole colony of ants carrying small flower petals back to their hill. They marched in tight formation across the trail struggling under their heavy loads even as their brethren headed back in the other direction to shoulder the next load. It was quite fascinating. Our hike the second day took place in a light rain. This hike followed the Village Creek trail mostly along the banks of the eponymous creek. The trail terminated at a nice swimming sandbar. If it had been warmer and sunny, it would have been a tempting place to take a dip. No, not that kind of quickie. This was a quick overnight stay. And yet another lovely Florida state park. Does everyone in Florida realize what treasures they have in these parks? This was Jim’s first selection of a place in which to stay. Situated right off Route 41 this is a perfect example of hidden treasure. It wasn’t a huge park, but it was big enough to have a little lake and a good selection of hiking trails. We got to the park early enough in the day that we could head off for a hike. Since this was just one night we didn’t bother unhitching, but just put down the stabilizers, hooked up the water and electric, opened up the propane tanks and there it was—home sweet home. It was a warm late afternoon and we had a good three mile hike across the sandy soil. One of us (no names will be mentioned, but he has four feet) was less than enthusiastic about the heat. Of course, when one insists on wearing a fur coat everywhere and everyday, the heat does take a toll. It was a very pleasant evening in the trailer and an early night. We had had a long stretch of rv parks and the quiet green outside our windows was all the more welcome.